Jake McGee threw a 20-pitch bullpen on Friday, and is nearing close for a return to the closer role. After a few solid outings, Carlos Estevez has allowed three earned runs and earned back-to-back losses. He was in Coors against Arizona, and that is always a downside to any arm inside Colorado's system. McGee is 15-18 on save opportunities this season, and has been a surprise in the fantasy world with the high altitude. Adam Ottavino is recovering from Tommy John surgery, throwing a scoreless inning with one hit and one strikeout on Thursday in his second appearance for the minor league squad. Jonathan Papelbon is nearing a rehab assignment, which he could start on Monday. This would shift Shawn Kelley back to the setup role, and if any occurring issues occur, he would be the guy to go out and grab. Kelley picked up a save against the Padres, but had two unearned runs in a loss against the Dodgers on the 22nd. Kelley has a strong 1.99 FIP, and a 12.65 K/9. Brandon Kintzler racked up his 3rd save, and has already looked much more consistent in the backend for Minnesota. He is a guy to go out and grab immediately as Glen Perkins is out for the year and Kevin Jepsen was horribly inconsistent. Trevor May also hit the DL, so this is Kintzler's job to lose. His 4.81 FIP and low 18% strikeout rate could possess some issues going forward. Will Harris allowed a run against the Angels in his last outing, but did notch the save. He still owns a 0.83 ERA, backed by a 1.72 FIP this season. His 8.82 K/9 continues to be decent enough, and should continue to lead the way for the surging Houston Astros. 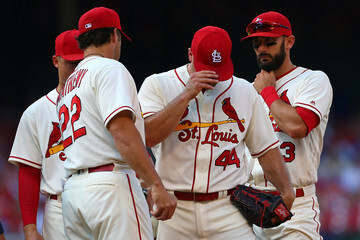 The St. Louis Cardinals have something going on in the bullpen we did not expect to see happen in 2016 -- and that is a change in the closer role. Trevor Rosenthal has been removed of his duties, and we have yet to know who. Rosenthal allowed a three-run shot to Adam Lind on Friday, and his ERA is now at 5.63 ERA. His walk rate is at a career high (17.7%), and he continues to have issues keeping the ball in the yard (1.13 HR/9). Kevin Siegrist and Seung-Hwan Oh are both in line to pick up some save opportunities, as one has not been named. Siegrist has a 4.20 FIP and a 2.79 ERA. Siegrist does have a 28.6% strikeout rate and has some experience. Oh has pitched well this season, and better than Siegrist. He owns a 1.66 ERA, backed by a FIP under two. He has a 34.9% strikeout rate, and if you were looking solely based on who has pitched better, Oh would be the guy to grab.